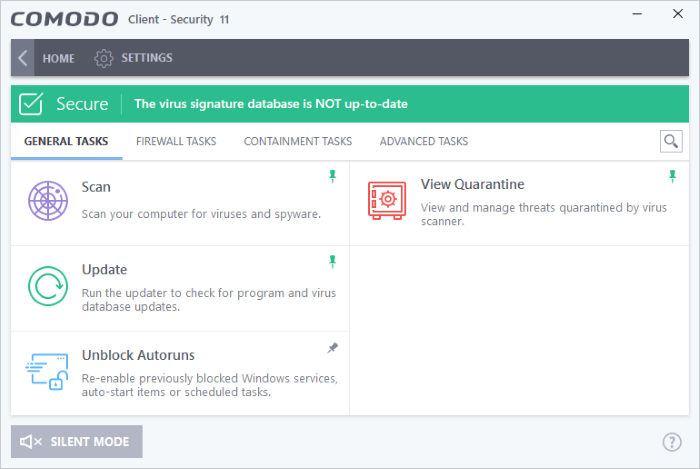 Comodo Client Security (CCS) offers complete protection against internal and external threats by combining a powerful antivirus, an enterprise class packet filtering firewall and an advanced host intrusion prevention system (HIPS). When used individually, each of these modules delivers superior protection against their specific threat challenge. When used together they provide a complete 'prevention, detection and cure' security system for your computer. Once installed on a Windows endpoint, CCS can be remotely configured and monitored from the Endpoint Manager console. Firewall - Highly configurable packet filtering firewall that constantly defends your system from inbound and outbound Internet attacks. Containment - Authenticates every executable and process running on your computer and prevents them from taking actions that could harm your computer. Unrecognized processes and applications will be auto-contained and run under a set of restrictions so they cannot harm your computer. This gives untrusted (but harmless) applications the freedom to operate whilst untrusted (and potentially malicious) applications are prevented from damaging your PC or data. VirusScope	- Monitors the activities of processes running on your computer and alerts you if they take actions that could potentially threaten your privacy and/or security. Using a system of behavior 'recognizers', VirusScope not only detects unauthorized actions but also allows you to completely undo them. Apart from representing another hi-tech layer of protection against malware, this also provides you with the granular power to reverse unwanted actions taken by legitimate software without blocking the software entirely.